Like other Legends before him, Johnny MacMillan is a Wapiti Arena Rink Rat Alumnus, an important credential and rite of passage for a young hockey enthusiast wanting to play senior hockey with the Key Club, Legion or the Red Devils along with Grande Prairie’s hockey heroes such as Pete Wright, Ken Head and Charlie Turner. Like others of this era, Johnny earned admission to a Saturday night home game by ringing a cowbell and wearing a sandwich board and later as a rink rat. Johnny arrived in Grande Prairie at age seven in 1942. He was noted for his skating and puck handling ability. These skills were developed on outdoor rinks, Bear Creek and frozen sloughs that had to be scraped after every snowfall. These outdoor resources were especially important for several years when the Wapiti Arena, Grande Prairie’s only covered ice surface, was condemned. Compensating for this loss, coaches, including Hockey Legend Johnny Macdonald and supportive parents organized games with teams in the neighboring towns of Sexsmith, Beaverlodge, Hythe and Dawson Creek . It was clear that Johnny possessed the foundation skills to become a career hockey player and that became his dream. In order to fulfill that dream he left Grande Prairie as a teen. His opportunity came in 1953 with an invitation to play for the Lethbridge Native Sons of the now defunct Western Canadian Junior Hockey League. His sparkling performance with the Native Sons drew attention across the border and in 1956 he joined the University of Denver hockey program. During his four years in Denver, the Pioneers won two NCAA championships. As coach of the Maple Leafs in 1960, Punch Imlach made a number of brilliant acquisitions that sparked the Leafs to three successive Stanley Cup titles and Johnny was among those acquisitions contributing to two of the three titles. Interestingly in 1960-61 one of Johnny’s teammates was another Grande Prairie product and Hockey Legend, Duke Edmundson. In 1963-64 Detroit purchased rights to Johnny and with the Red Wings he narrowly missed acquiring a third Stanley Cup ring with teammates Gordie Howe and Norm Ullman. 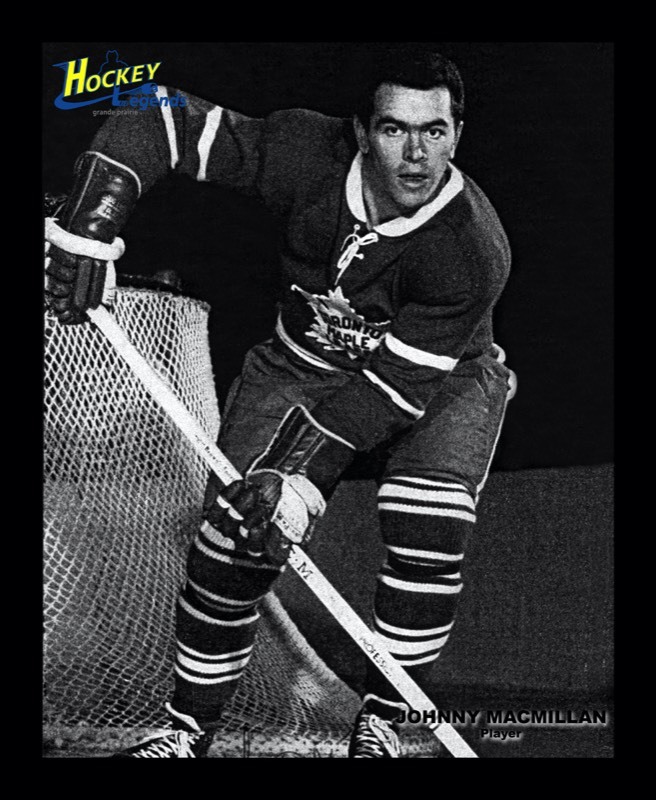 Johnny also made his mark in the minors with the Rochester Americans in the AHL where he scored 22 goals in1962-63. He was also on the roster of the Pittsburgh Hornets and the Memphis Wings. In all of these venues he was noted for his scoring touch and excellent two-way performance. From 1966 until his retirement from pro hockey in 1971, Johnny was a crowd favorite with the San Diego Gulls. Dating back to 1953 when he played with the Lethbridge Native sons, Johnny had a hockey career that spanned a total of eighteen years. Among hockey honors that Johnny earned was membership on the second WCHA All Star Team following a 30-goal season in 1959 – 60 with the Lethbridge Native Sons. He was Captain for his final season with the Denver University Pioneers and Captain of the San Diego Gulls for the 1969 – 71 seasons. He was inducted into the Lethbridge Sports Hall of Fame in 1995 and the Denver University Sports Hall of Fame in 2001. Johnny MacMillan - a Grande Prairie Hockey Legend in 2005.